Saturday night in West Hollywood, the surf was up! 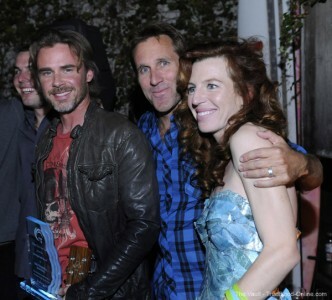 I attended a charity gala event for Project Save our Surf, called “Actors for Oceans” at the Falcon Restaurant on Sunset Boulevard. The event’s purpose was to raise awareness and gather contributions toward keeping our oceans clean and to support the organization . 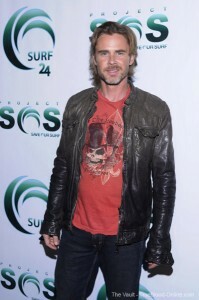 In addition to Sam Trammell, there were many celebrities attending the event including True Blood’s Michelle Forbes, Natasha Alam and Michael McMillian. Also attending were actresses, Tanna Frederick (the founder of the S.O.S.) and Tia Carrere. 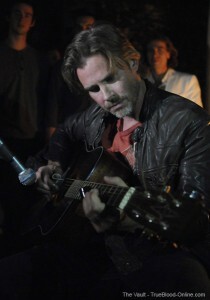 Scheduled to perform their musical talents was actress, Tia Carrere and True Blood’s Sam Trammell. After a short stint on the red carpet, Sam walked to the restaurant. Before he entered, I met him and asked him if he would agree to a short video interview with me. As Sam is always extremely gracious, he said, “Sure”. Once inside we spoke for a few minutes as he posed for photographs with lots of attendees. Originally, he wanted to do the interview right away, but after a few minutes inside, we both realized that it was just too noisy and crazy then, so we decided to wait until after he performed. Before Sam performed he mingled with the crowd and again was extremely friendly and gracious. Sam and Tia Carrere were scheduled to perform and Tia was first on the program. she sang two songs for the Mauli Ola Foundation. She was accompanied by Daniel Ho on guitar. The Mauli Ola Foundation and their program, “Surf Experience Days”, pairs professional surf instructors and novice surf students who have Cystic Fibrosis to introduce them to the healing properties of exercise, ocean air, achievement, and fun in a supportive environment. Hypertonic saline (which is prevalent in the ocean air just above the water’s surface) has been shown to be a natural treatment for people with Cystic Fibrosis. Then, after a brief five minute break, it was Sam’s turn to perform. I thought he did really well even with the poor sound quality which was not the best. There was no stage and lots of things going while he was playing, including the silent auction. As you will hear in the video interview below, Sam told me that he couldn’t hear what he was playing, so he had no idea how it sounded. He was quite good and I think he has musical talent and would have excelled if he had pursued it as a profession. It was very brave of him to play for us and I applaud his effort. After Sam’s performance, Tanna Frederick gave Sam an award and told the crowd that Sam had agreed to be on the Board of S.O.S. They both discussed the repeat of the successful 24 hour surfing event which is in the planning to be held again next year. Then, everyone mingled while Sam and the event organizers posed for several photos. Sam bid on an item in the silent auction and won. It was a fabulous surfing photo that he shows off in our video interview below. Once Sam was free, he and I went out to the now abandoned red carpet area which had plenty of light and was not as noisy as inside the restaurant (although still pretty loud) to do the interview. In addition to discussing the photo, during the interview, Sam talks about attending Eyecon 2010 last week and meeting several Billsbabes there including our very own Michael, aka, SterlingSilverCharm. He also discusses True Blood, how he got involved in the S.O.S., and how he hasn’t played guitar since he was a kid. Once again, I continue to be amazed by the congeniality of all of the True Blood cast I have met and Sam is way up there in my esteem for his sincere generosity and friendliness. Nothing seems to phase him when it comes to his fans, he is accepting of them all with not a critical word to anyone. Many additional photos can be found in the Photo Gallery. Wonderful report and interview with Sam. Thanks so much, Lynn. You did a fantastic job. It was good to learn of the many organizations that are concerned with cleaning up and saving our oceans. Sam seems so easy to talk to. He’s charming and very engaging. I had some difficulty hearing him play due to background noise. But what I heard I enjoyed very much. He did a super job. So THAT’s where you’ve been! Chasing after my homeboy. Whatever am I going to do with you? Fantastic interview with Sam! So nice of him to spend his time speaking to you Lynn. Who knew he was such a great guitar player? It’s nice to see him get involved in such a worthy cause. Lynn, job well done. You keep your paws off my Sam…He is so sweet and generous with his time. I just love him..
Well wasn’t that nice…he’s something else, isn’t he? Thanks for sharing and getting this easy, breezy interview with him. It made me feel like I was talking to him. Good job, Lynn! Sam is a gracious charming man . Talented as well. I enjoyed his performance and the interview. You did a great job Lynn as always. I was there last night and it was a wonderful event. The place was packed with supporters. Sam was gorgeous, of course. He’s immensely talented. Lynn, you’re right. He could have made it as a musician. It’s not too late. I was standing right by the fireplace so it wasn’t as hard to hear. I’d love to see him do a full concert. Tanna Frederick was stunning, as usual, this time in a dress made from recycled paper. I admire and appreciate people like Sam and Tanna who not only put their money where their mouth is but actively participate (and get others to help) in activities that make the world a better place. Thanks for the vids. Sam seems like quite the talented guitar player. What I was able to hear was really good. He’s so generous with his time, actively supporting a wonderful cause. Kudos! I had an opportunity to meet him at Dragon-Con. And while it was a brief meeting, you can totally tell that he loves interacting with the fans. A complete sweetheart. Great job, as always, Lynn! Thanks Lynn for sharing another awesome experience with a TB cast member. You’re really getting good at this! Is it possible for a Billsbabe to be a Samsbabe as well? Loved his acoustic number!